The Rhodia "webby" is my current weapon of choice, but the newly available Baron Fig Confidant has me considering a status change from "in a relationship" to "it's complicated." The Baron Fig Confidant originated as a highly successful Kickstarter project that funded in October of 2013. My need for instant gratification held me back during the Kickstarter days, but now that the Confidant is generally available I decided to give it a test drive. This is a very competitive price for this category of journal. It's about the same price you would pay for a lower quality Moleskine notebook on Amazon. It's a significant savings over the Rhodia and Leuchtturm, either of which will set you back around $19 under best case conditions. The Confidant is delivered is a solid cardboard box, a nice upgrade from the usual shrink wrap only treatment. The box also includes a nicely designed paper insert to set the tone. I bristled a bit at the insert initially, since I felt like I was being sold "an experience." However, as I read through it, the messaging did strike me as sincere. In particular, their statements about listening to and engaging with customers really resonated. They do a appear to be backing this up as well, since they were quick to engage after I mentioned them in an off-the-cuff tweet. This approachability sets Baron Fig apart from Rhodia and Leuchtturm, who might as well be on Mars in terms of my ability to discuss product feedback with them. The book itself feels well made. My subjective take is that the build quality is about equivalent to the Leuchtturm and maybe a slight step down from the Rhodia. That said, it's a very attractive book that feels good in the hand. 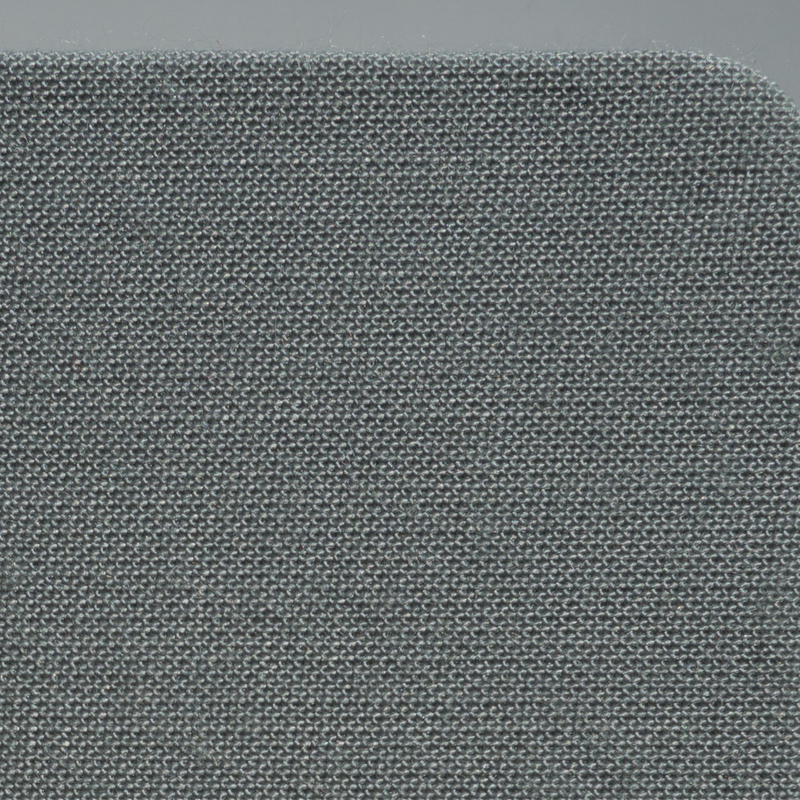 The cover of the Confidant is a gray fabric wrap, a departure from the usual leatherette that most comparable journals use. This looks and feels nice. However, one minor nit is that grain of the fabric (on mine, at least) has a noticeable slant that is not square with the edge of the book. This may be an annoyance to those who lean to the obsessive-compulsive side of things, but I stopped noticing it pretty quickly. I also suspect that minor kinks like this will be worked out as Baron Fig gets more production time under its belt. Overall, I really like the fact that they did something a bit different with the cover material, but it will be interesting to see how well fabric holds up to my world of coffee shop tables, airplane trays, and sticky toddler fingers. At 5.4" by 7.7", the Confidant is slightly smaller than its contemporaries. I haven't found any downside to this, and the fact that the book is a little more portable (and exactly the same size as my iPad mini) is a plus. The pages are closer to a pure white when compared to the cream color pages in the Rhodia and Leuchtturm. The dots on the page are noticeably larger than any other dot grid paper I've used. I immediately preferred the white pages of the Baron Fig. As a fountain pen user, I appreciate the fact that it gives me a truer representation of my ink color. I wasn't crazy about the larger dots initially. However, they have since grown on me. I think I just needed to adapt to the subtle difference. Since I travel frequently, I generally keep a Pilot Vanishing Point with regular Pilot Namiki blue black cartridges in rotation as my workhorse pen. This combination performs wonderfully on the Baron Fig paper. Weighing in at a hefty 100 gsm, the paper has a similar matte feel to the Leuchtturm. It doesn't match the smoothness of the unicorn tear-coated Clairfontaine paper in the Rhodia, but it is quite nice nonetheless. The results were very good. The paper is very fountain pen friendly in the fine to European medium nib range. 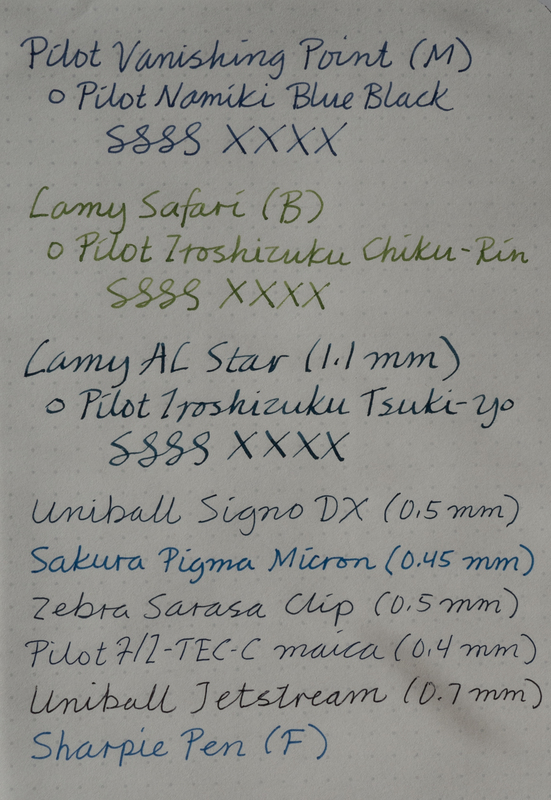 Broad and beyond starts to generate some slight feathering and bleed-through spots, but overall I've been quite happy with the performance in my typical day-to-day fountain pen use. The Confidant lays flat when in use as advertised. However, I did notice that after using it a couple of times, the front cover started creeping up a bit when the book was closed. Unlike most of its peers, the Confidant does not have an elastic that holds the cover closed when not in use. I'm undecided on how much this really matters. I suspect that it will sort itself out or become a non-issue with me during longer term use. 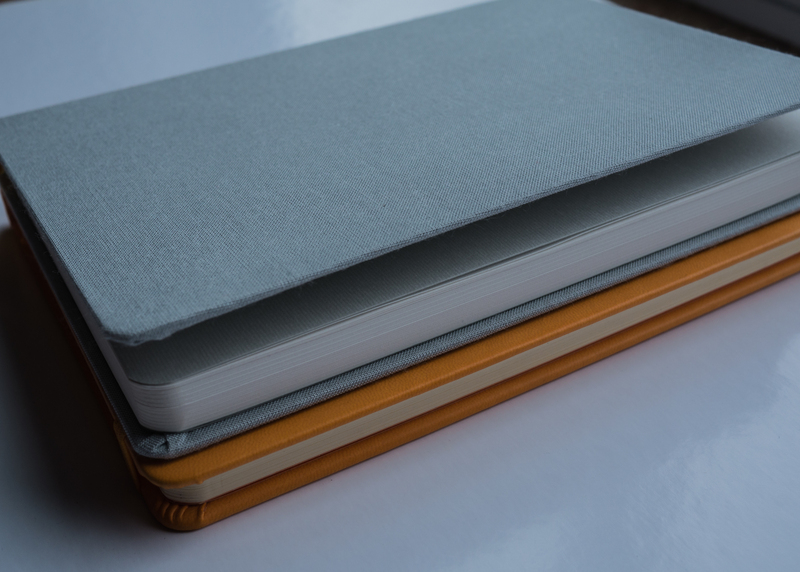 My first impression of the Baron Fig Confidant was that it is a very nice notebook at a fair price that most likely wouldn't displace the Rhodia Webnotebook as my daily driver. However, the more I use the Baron Fig, the more I like it. I have some concerns about the durability and long term cleanliness of the fabric cover. I've put it into daily use as my bullet journal, so I will post a quick "road test" update once I fill it up. 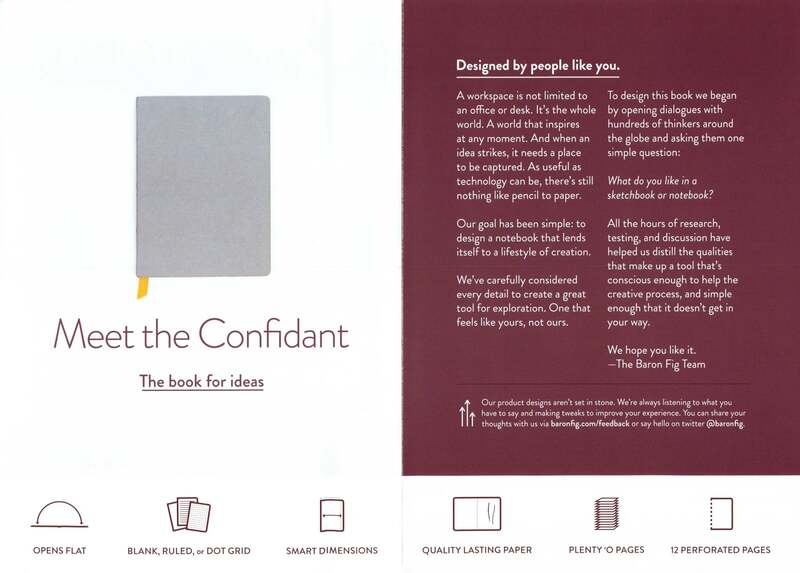 If the Confidant holds up reasonably well, its value, appearance, paper quality, and customer-focused company culture may very well bump it to the top of my list.